How is VLSI different from Software? VLSI is about designing microprocessors and other cool integrated circuits (ICs) like modems, Networking chipsets, Telecomm chipsets, Graphics chipsets, Memories for computers etc. IC’s which have multi-million transistors in them are classified as VLSI chips or VLSI designs. Whereas Software is about developing software applications involving coding, testing and programming.. There is a worldwide downturn, is the VLSI industry affected? Yes, the VLSI industry is consumer driven and downturns are not new to India - remember the slowdown that hit us after Y2K. The good news is, downturns will be there but things turn around and get better than before. New players will enter the market -place, new opportunities will be created and the economy will start to grow..
What is the best thing to do in a downturn ? Great question!! In short do something!! Take advantage of the times you are in. In the US people enroll into industry oriented programs during such periods to retrain and update their skills. Companies hire trained talent that can be productive quickly. RV-VLSI programs are designed to make you productive in a short time. Enquiries from companies for trained talent has been steadily rising at RV-VLSI..
Are all VLSI Companies the same? No, all VLSI companies are not the same. They may be classified as product companies, service providers who hire well qualified talent and depute them to work on design projects of their customers; and EDA companies who design software which is used by product companies to design chips. Further companies differ in size; some are small start ups, some are small companies in niche areas whereas others are medium or large companies. Major world renowned VLSI companies have their operations in India and particularly concentrated in Bangalore in a big way..
What opportunities are available in VLSI? VLSI offers great opportunities in chip design in the areas of ASIC, FPGA design and Custom Layout design. The job opportunities are in Front End- RTL design and Coding, Verification, synthesis, Implementation, Static Time Analysis, and Design for Test. The Back End jobs are - Physical design, Custom Layout, Place and Route. About 120 VLSI companies operate in India and the number is growing. These companies are concentrated in Bangalore, Hyderabad and Noida. Other cities such as Chennai, Pune, Kolkata, Mumbai, Cochin are fast catching up.. I am a BE in Electronics & Communications with a software job offer. Should I take it up? This is really a question for you to take a call. Take up a job where you get an opportunity to utilize your core knowledge learnt in engineering or diploma and you will be more valuable with time to employers. You may find it surprising but there are many VLSI positions which require software programming skills which engineers have, that go unfilled. To be precise about 60% of openings in VLSI today require engineers with programming skills. Do you have the passion to make a career in VLSI? If the answer is yes, you should go for it (send us an email and we will be happy to provide free counseling to you so you can take an informed decision) and not any software job which is not related to your engineering discipline. Remember that you have graduated in electronics & electrical engineering, but software is about coding and designing software application or QA of software. Any non-engineering graduate can take up a software job with some training, but not a job in VLSI for sure..
Will your VLSI courses benefit me in doing my BE/ME project work?? Yes our modules will benefit you immensely in carrying out your project work as they reinforce your basic electronic concepts together with modules that will give you a real feel of VLSI with hands on experience. Guidance from industry experienced faculty will give you the confidence to face the viva and campus interviews. You will also be taught to prepare your resumes highlighting the projects done by you. Remember, one guaranteed question in a job interview for the rest of your working life will be on your undergrad or post grad project, so please choose a project wisely such that it adds weight to your resume. Every year RV-VLSI offers FREE BE projects to qualifying students. However a nominal fee is charged to conduct pre-project training if necessary. Many students have already benefited from this and are now working in reputed multinational companies with great packages..
What are the areas of specialization in VLSI; which ones are in demand and have more scope? The two main areas are Front End and Back End. Front End consists of specializations in: RTL Design, Coding and Verification, Design Implementation, DFT and STA. Back End consists of Physical Design, Custom Layout and Physical verification. There are many openings for Application Engineers, CAD engineers etc. where knowledge of the complete design cycle followed by a specialization will make your resume stand out among other resumes..
How can I be sure that what is taught at RV-VLSI is relevant to current industry needs? RV-VLSI courseware is designed to meet the needs of industry. The training is imparted by industry experienced faculty with decades of industry experience. We have conducted corporate training for companies like NXP. RV-VLSI programs have a balanced mix of modules which cover the complete design steps from RTL to GDS. Our students are accepted by some of the top VLSI product companies like INTEL, CYPRESS SEMICONDUCTORS, SYNOPSYS, NETLOGIC, and RMI to name a few.. I am a working professional in VLSI. Can I benefit from your courses? Of course you will. Many working professionals from companies like Honeywell, ST, Intel and Philips have benefited by attending our courses. Weather you are looking to upgrade your self with the latest in your area of specialization or looking for a change of track (Lateral move) we have programs that will help you. Please call or email us for details. Do I have to take up the entire course in Advanced Diploma in Asic Design (ADAD)? Can I take up module by module? You have both options. You can take up the 6 months course if you have time. If you don’t have the time then you can take up the course module -by- module, as per your convenience. Details can be had in person..
Do you have a part time course? We do not have a part time course. However the program is quite flexible. In a day you need to invest about three hours for theory sessions- the research lab is open till late in the evening and on Saturdays you have the flexibility to complete your practicals at your convenience. Depending on the module you pick you will need to attend five half days or ten half days as the case may be.. If I am unable to continue the course due to some reason/s, can I complete it later? If the reasons are pressing, compelling and genuine you can complete the course later subject to availability of a seat; but not later than 6 months from first joining. Management reserves the right in these matters.. I Plan to go abroad for my Master's degree. Will your course be helpful to me in any way? The course will be useful. We have had many students taking up our course before going to foreign universities for their Master’s program in VLSI. The practical orientation of the course could help them get campus job opportunities and assistantships.. I am confused!- should I go for an M.Tech Course or the ADAD course? Which will benefit me more? We believe experience is your best teacher. One strategy is to do a job oriented program at RV-VLSI- get into the industry and avail higher education benefits provided by most companies for enrolling into part time MTECH courses. If you are serious about a career in VLSI after your graduation you should go for the Advanced Diploma in Asic Design. However if your interests are academic pursuits, you should go for M.Tech courses offered by reputed universities only..
How is your courseware and teaching methodology different from any other training institute? RV-VLSI is a unique combination of a design center, VLSI finishing school, research center and learning center. Investments worth millions of dollars have been made with a view to provide the best education and industry specific training experience to you. We believe RV-VLSI is a new concept in VLSI education and a unique center in the entire country. Students, faculty from various colleges and industry professionals have benefited from our state –of- the- art facility. Click here to read what one of our student’s has to say about us. Another big differentiator of RV-VLSI is that: its founder CEO is from the industry and devotes his full time to RV-VLSI - to provide quality education in VLSI with an industry focus. He took the voluntary decision to move from a VLSI company in the US into education and training- to make a difference to society and the semiconductor ecosystem. An able team of like minded professionals with industry experience assist him in helping aspiring engineers realize their goals..
Can I do my lab work on Saturdays and Sundays only? If you are a student of the full time ADAD / ICML program you have to do your lab work during Monday to Friday as specified. If you are a working professional and have taken up a particular module or modules, you could have some flexibility in doing your projects on Week-days, during the evenings, and Saturdays within the specified working hours. No project work is allowed on Sundays..
Do you guarantee a job after training? As a policy we do not offer job guarantees to anyone. We guarantee you the best training which truly covers the entire design flow from concept to GDS-that you can possibly get in VLSI. Our courseware and labs are well designed to help you navigate through the interview confidently. We provide exciting project experience, training on writing resumes, mock interviews to boost your confidence. We are proud of the fact that our track record of placements is impressive and many VLSI companies frequently visit us for campus placements.. I have experience in software and have an electronics background. Will a career switch to VLSI enable me to get a job? If you are bored with the software job/ have been a recipient of a Pink Slip, career opportunities await you in the VLSI industry provided you are determined to make a change and are passionate about VLSI. Come to us and we will show you how to architect your career afresh.. In adverse economic situations will I still be able to get a job after doing the course? No doubt during a downturn in economy, there is a general impact on all industries including VLSI. However this is the best time to get trained and upgrade one’s skills to take the benefit of an economic upswing whenever it takes place. Moreover our experience tells that good companies are always on the look out for good candidates and recruit them irrespective of market conditions- sometimes going out of the way to create a new Recce..
What kind of salaries do VLSI companies offer? VLSI Companies offer salaries comparable to the best software companies and some times even exceeding them. As per our knowledge, salaries could range from 3 lakh to 5 lakh / annum based on candidate’s performance-and with stock options..
Will I get a regular job or will I be placed as an apprentice / trainee? This depends on the company. Mostly companies hire for regular positions and put candidates on probation for 3-6 months. Sometimes based on performance, candidates are given regular employment in two to three months itself. Some companies do designate candidates as trainees for 6 months or so and then provide regular employment thereafter.. I want to gain knowledge in VLSI and I am not looking for a job. Can I join the ADAD course? You can join the course even if you are looking for knowledge in VLSI without expectation of placement.. If there is any delay in getting a job after completing the course, can I continue to work in the VLSI lab till I get a job? As per standard practice of RV-VLSI, we do not encourage this. However when we intimate you about an interview scheduled after the completion of the course you are given an opportunity to seek any clarifications you may have with the faculty before attending the interview.. I have low marks in my degree course. Will this affect my admission or my chance to get a job after the course? Admission criteria are not by marks alone. Selection is through a written test and interview. Only candidates passing the test and interview are admitted. Generally candidates are considered for employment after completing our courses, and marks are not an issue with most companies. However this aspect is ultimately left to the company’s discretion.. I had some back logs and carry forward of subjects in my semester. Will this affect my chance of getting placed? This depends on a particular company’s policy and can vary from company to company. However according to our experience really good Candidates, through dedication and hard work can overcome this problem through their performance in interviews. In cases were we have received instructions from companies not to forward such resume we do not but the good news is such companies are very few..
How can I identify and differentiate a quality training institute from another? A good training institute is one which provides industry oriented courseware and training, using necessary infrastructure which is as close to an industry environment; with knowledgeable and industry experienced faculty who can instill in you the appropriate industry work culture that will enable you to get a job. A good institute says what they do and does what they say. The major differentiator is in what is being taught, how it is being taught and who is teaching it. There are many training institutes around the country which claim they teach VLSI but limit the modules to only basic RTL design and verification. True VLSI training must cover all aspects from Concepts to GDS for different methodologies like ASIC and FPGA followed by abundant time spent in solving challenging design problems using tools The focus must be on solving problems using software and not software training. How is RV-VLSI different from any other training institute? 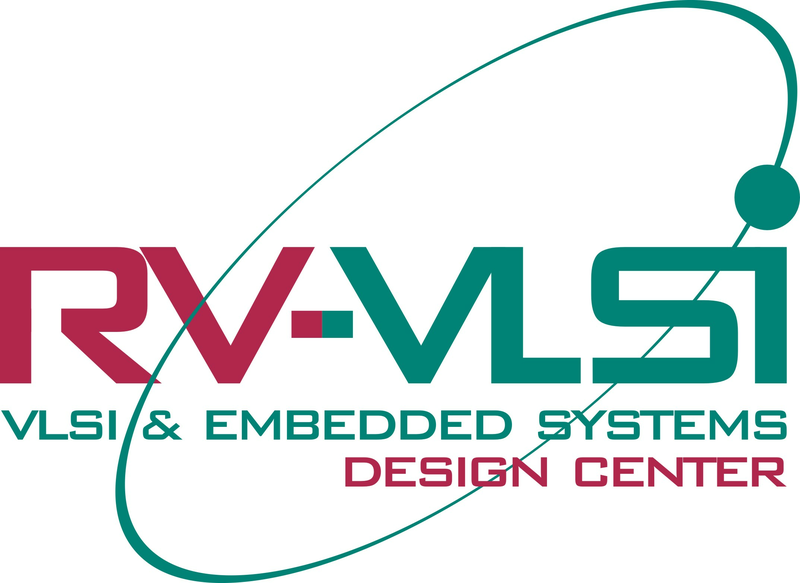 RV- VLSI Design Center has all the ingredients of a ‘Good Training Institute’ mentioned above and has been successful in making industry take note of its training capabilities. The Candidates trained at RV-VLSI have been placed in reputed MNCs and are on the job after a very short orientation program in the companies that recruited them. RV-VLSI trains students to be productive in industry in a very short time. Hands-on-training is imparted in ‘ABHYAS’- our learning lab, which gives students an opportunity to: hone their skills in VLSI-from Concept to GDS- for different methodologies(ASIC and FPGA)- solve challenging design problems- and work on industry relevant projects in an environment similar to that in the best of VLSI companies. We transform you into a confident VLSI professional capable of facing tough job interviews and achieving success in your career. We are a SUN CENTRE OF EXCELLENCE –with capacity a design a 1Bn transistor chip-something that not many training institutes can even think of..
We can refer you to some banks that provide loans..
Do I have to come to Bangalore to take the tests? No. You don’t have to come to Bangalore unless you want to. You can take our ONLINE Aptitude and Technical Tests through our 7 centers in Bangalore, Pune, Mumbai, Hyderabad, Chennai, Kolkata, and Delhi..